A couple months ago the independent (indie) skincare brand, Banish, reached out and asked me if I would like to try some of their products. 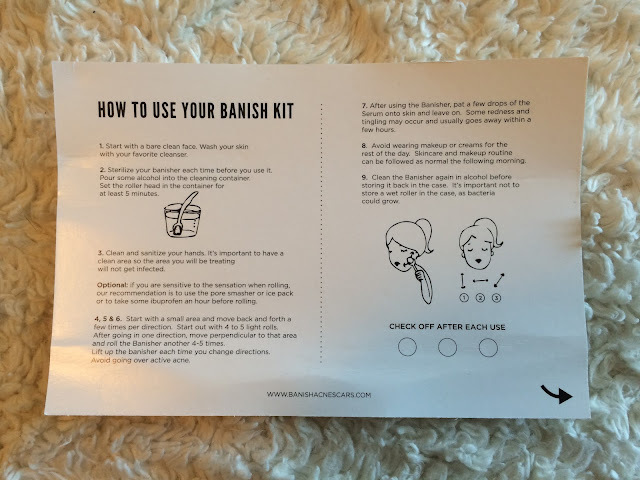 I took a look around their site, and after seeing that they focused on products made for acne prone skin, I happily accepted their offer. My skin is finicky to put it simply - it's acne-prone, but since starting Curology most of my breakouts are hormonal or product caused, my regular full face acne has mostly cleared up. It's sensitive, starting to show mild signs of aging, and while I have an oily t-zone, other parts of my face are normal or so dry they peel at times. To summarize; I have sensitive, acne-prone, combination (combo) skin. This is a lotion cleanser formulated without sulfates so it does not foam. 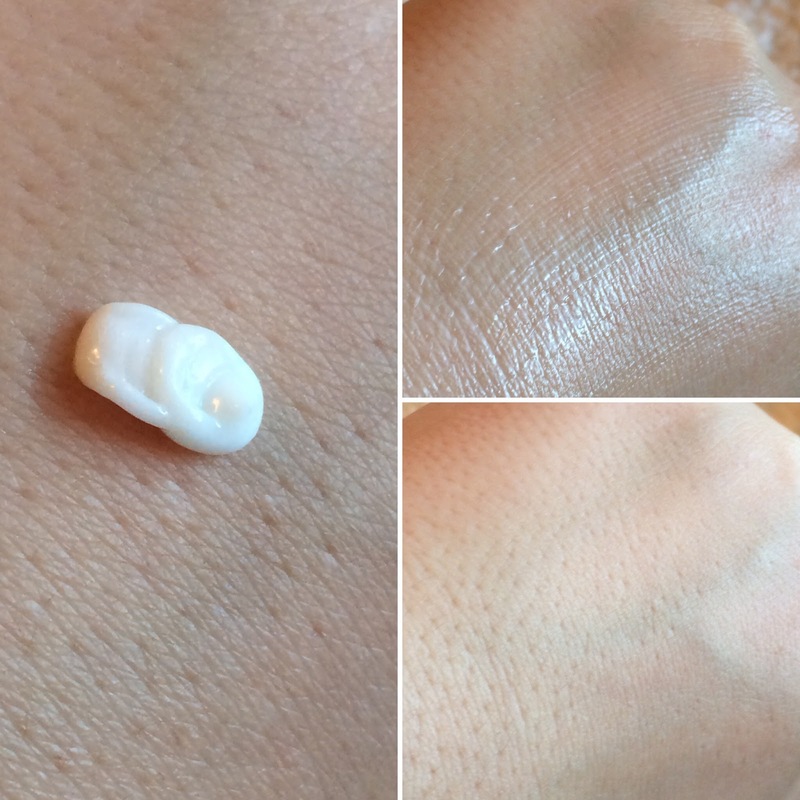 I know many of you like your foaming cleansers, but this cleanser definitely has a permanent place in my routine - and I'll tell you why in just a moment. This cleanser is part of the Banish Kit because it's perfect for use before using the Banisher, and for gentle cleansing the few days following the use of the dermaroller. This cleanser has a bit of a minty scent to it. It has the consistency of body lotion or a light facial moisturizer, and is dispensed with a pump top on a glass bottle. 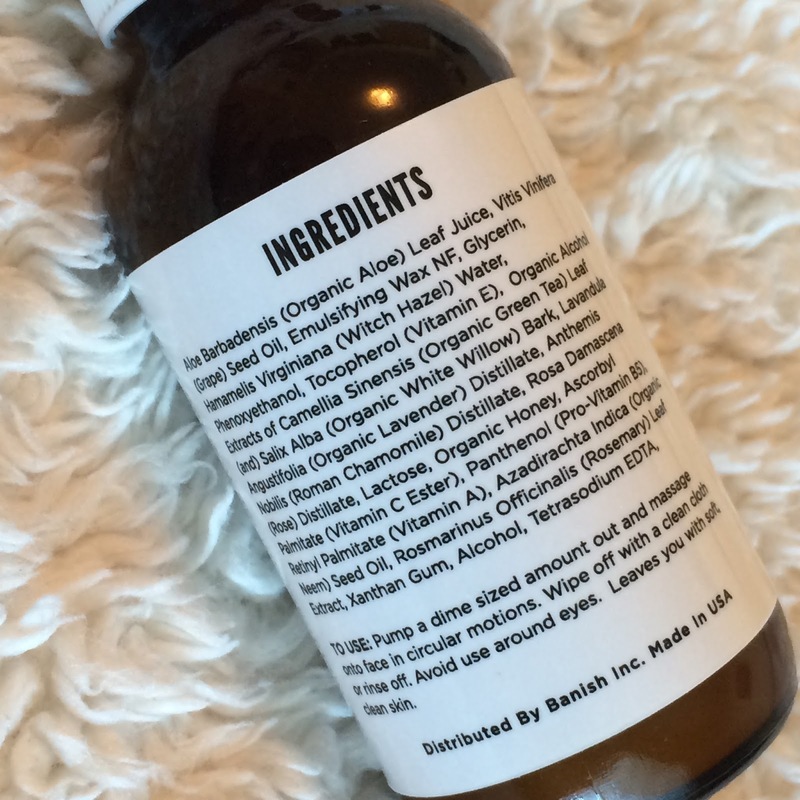 It contains some hydrating and soothing ingredients like aloe, witch hazel, green tea, and chamomile. 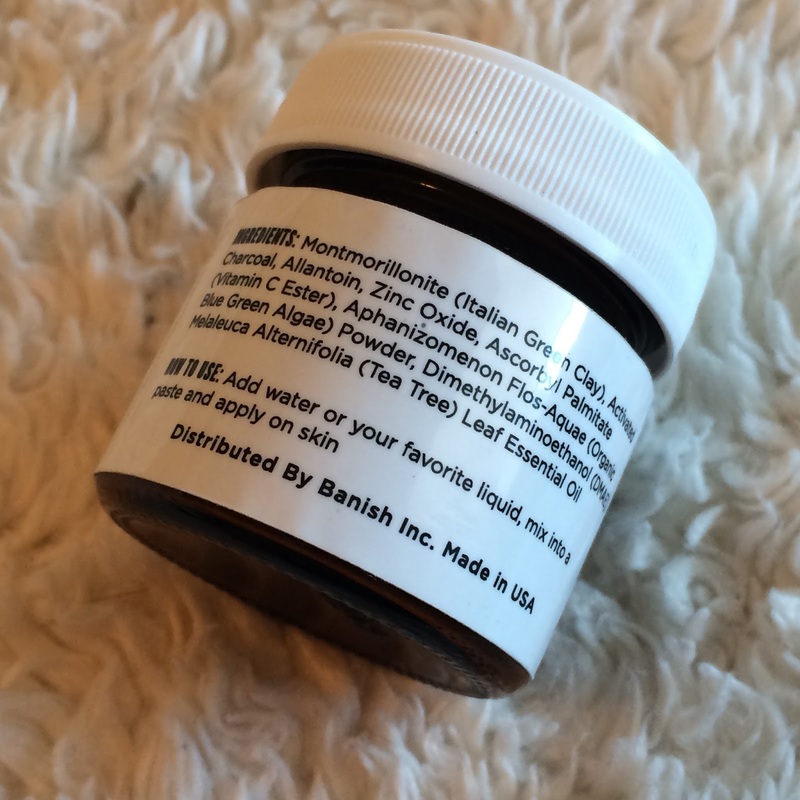 It also contains some gentle acne fighting ingredients like willow bark and neem oil. 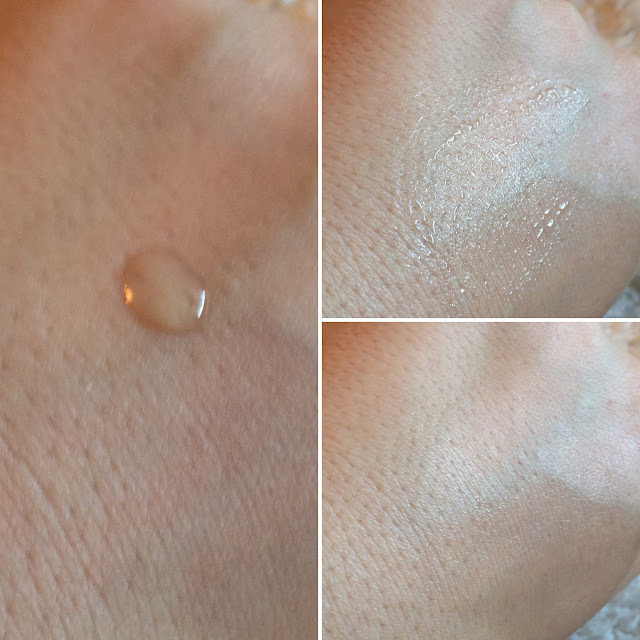 Either as my only cleanser, or after oil cleansing, I apply a dime size amount amount of cleanser to my hand as the directions suggest, which I figure to be about 5 pumps, and I massage the lotion around my face. As I mentioned above it smells minty, but it also gives a cooling sensation to the skin. It's quite refreshing! I massage the cleanser for about 30 seconds to a full minute and rinse off as I would any other cleanser. What I love is that the extracts and oils have a chance to absorb into my skin a bit while I'm massaging this cleanser into my skin, and when I rinse it away my skin feels smooth, soft, and hydrated. It's a feeling I don't get often from a cleanser - usually just from cream cleansers, but this rinses away much more easily for me, eliminating the need to follow up with a third cleanser. Since this is such a gentle cleanser, I find I have to use something with a bit more oomph in the evenings sometimes - like my Cosrx gel cleanser - but if my skin is especially dry I will use it after oil cleansing. My favorite uses for this lotion cleanser are in the mornings, before dermarolling, and both morning and night the day following dermarolling. Ingredients: Aloe Barbadensis (Organic Aloe) Leaf Juice, Vitis Vinifera (Grape) Seed Oil, Emulsifying Wax NF, Glycerin, Hamamelis Virginiana (Witch Hazel) Water, Phenoxyethanol, Tocopherol (Vitamin E), Organic Alcohol Extracts of Camellia Sinensis (Organic Green Tea) Leaf (and) Salix Alba (Organic White Willow) Bark, Lavandula Angustifolia (Organic Lavender) Distillate, Anthemis Nobilis (Roman Chamomile) Distillate, Rosa Damascena (Rose) Distillate, Lactose, Organic Honey, Ascorbyl Palmitate (Vitamin C Ester), Panthenol (Pro-Vitamin B5), Retinyl Palmitate (Vitamin A), Azadirachta Indica (Organic Neem) Seed Oil, Rosmarinus Officinalis (Rosemary) Leaf Extract, Xanthan Gum, Alcohol, Tetrasodium EDTA. 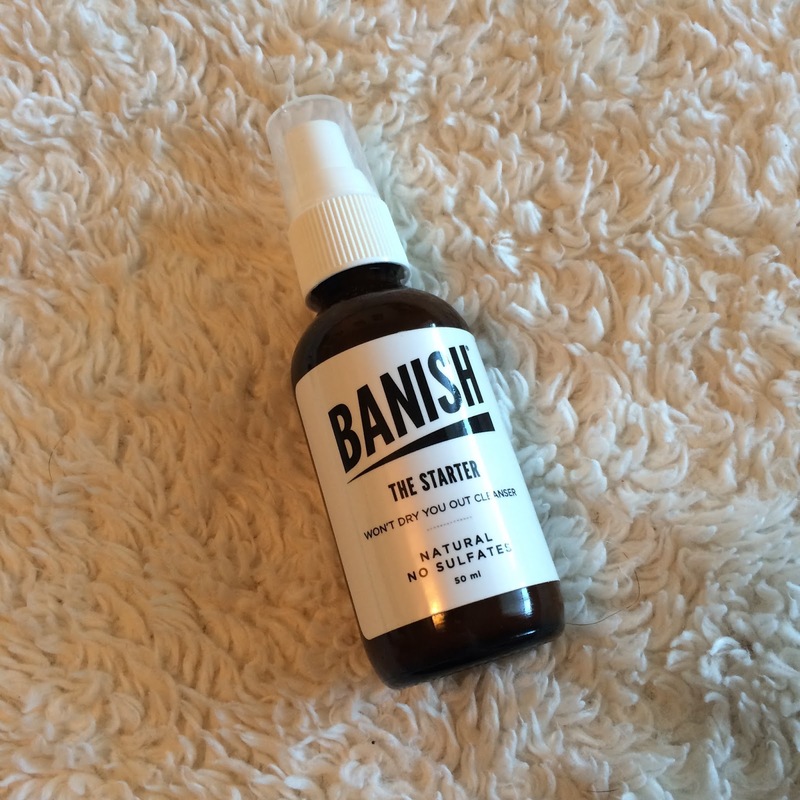 The Starter Cleanser is currently available for $29 for 50ml of product, or in the Banish Kit for $75. This is a triple anti-oxidant serum containing vitamin c, ferulic acid, and vitamin e. This trio works to reduce the appearance of age spots and wrinkles, improve elasticity, reduce redness and dryness, and firm and brighten skin. This serum has an almost oily texture to it, but does absorb after a while if you only apply a few drops. It contains 99% L-Ascorbic Acid for brightening, smoothing, and firming effects on the skin. The Vitamin C Serum works best for me after dermarolling, because of it's thicker, hydrating formula - this is also suggested by the directions. 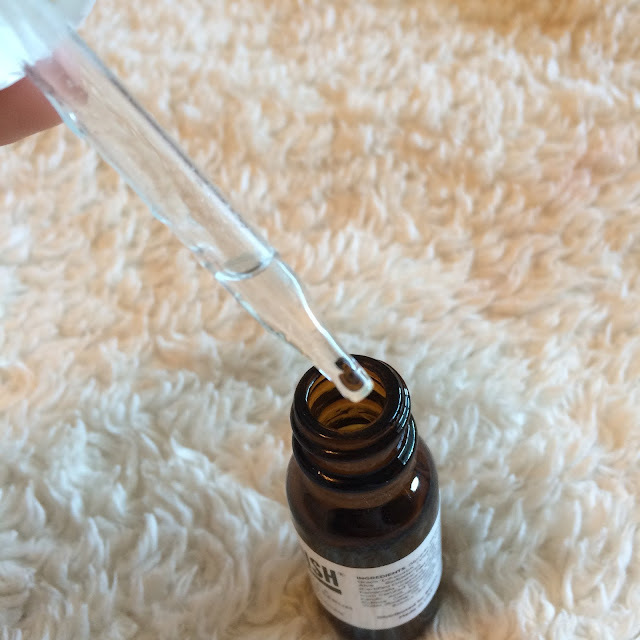 I apply 4 drops, because your skin will absorb more after dermarolling, so the minute or so of stickiness isn't a big deal, because my skin will completely absorb the serum afterwards. 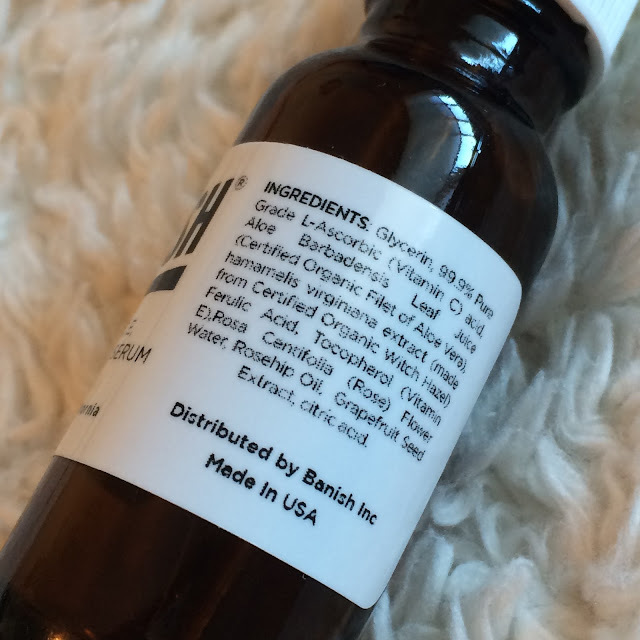 It has a sweet sugary citrus scent, but unlike some other vitamin c serums, this one does not burn upon application. Ingredients: Glycerin, 99.9% Pure Grade L-Ascorbic (Vitamin C) acid, Aloe Barbadensis Leaf Juice (Certified Organic Filet of Aloe Vera), hamamelis virginiana extract (made from Certified Organic Witch Hazel) Ferulic Acid, Tocopherol (Vitamin E),Rosa Centifolia (Rose) Flower Water, Rosehip Oil, Grapefruit Seed Extract, citric acid. The Vitamin C Serum is currently available for $49 for 15ml of product, or in the Banish Kit for $75. 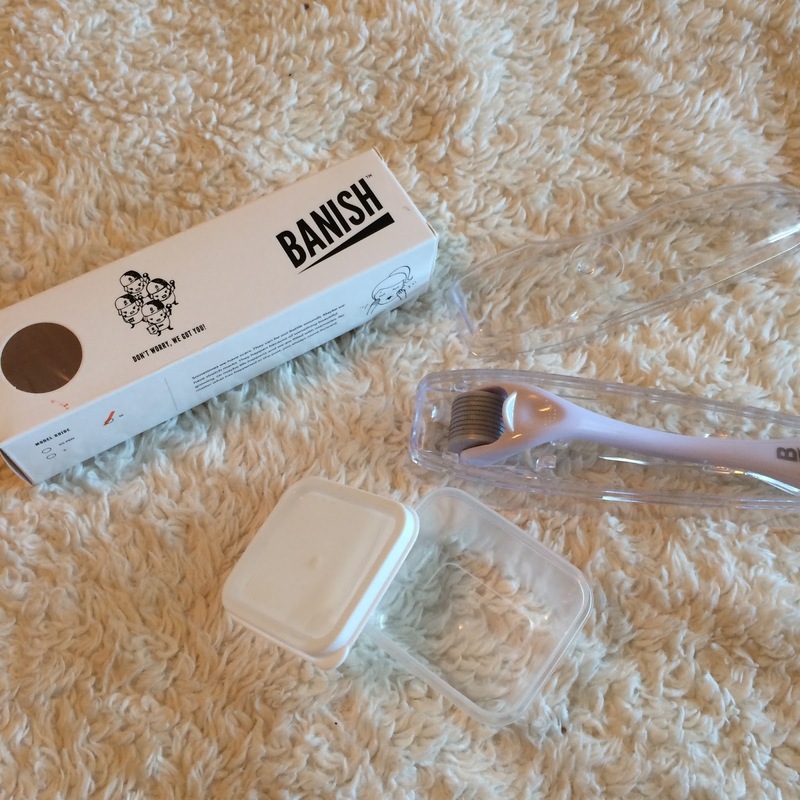 The Banisher is a .5mm dermaroller. 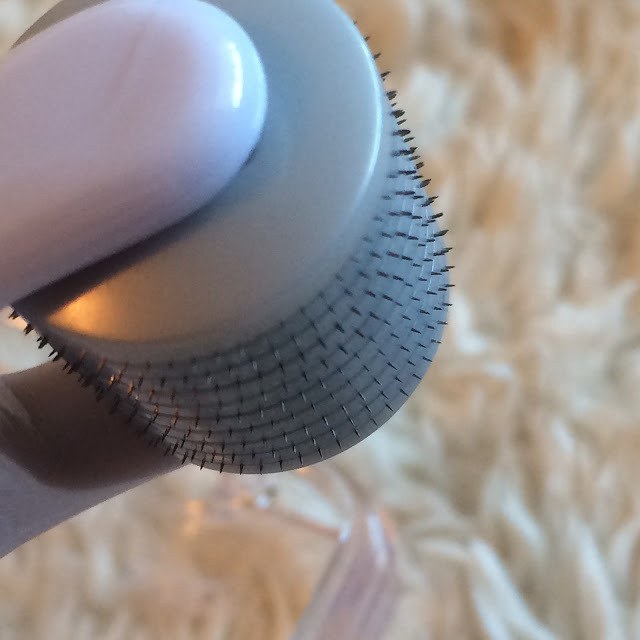 I've tried dermarolling (or microneedling) in the past but never kept up with it, despite feeling like it was improving my skin. 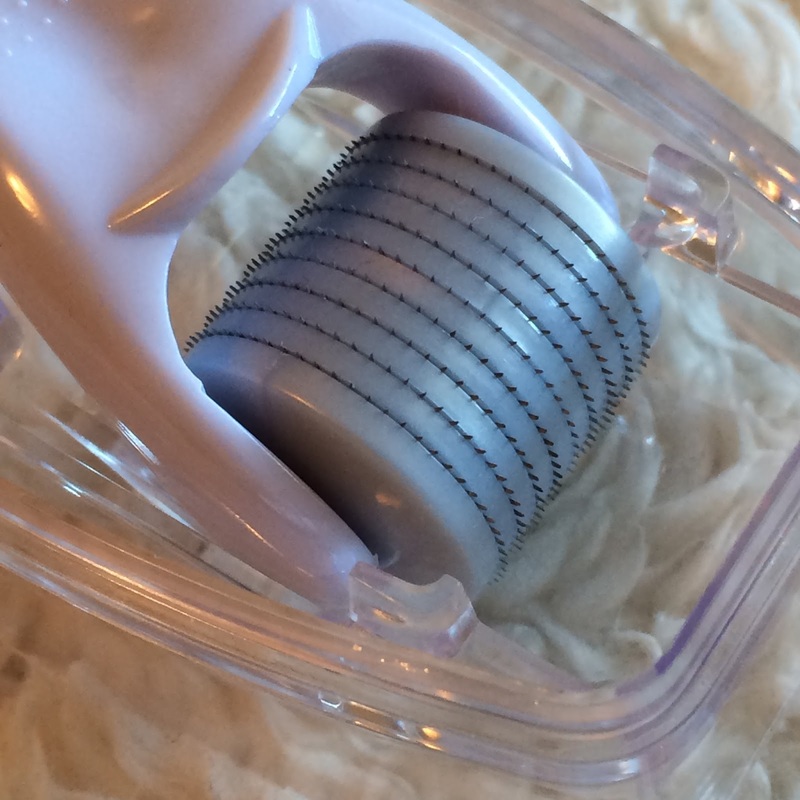 The Banisher (like other dermarollers) is a handle with a roller on one end. The roller houses hundreds of tiny needles that puncture the skin - breaking down old scars and stimulating your skins' instinct to heal and produce collagen. Collagen will rebuild and your skin will thicken, making it stronger and firmer than before with regular use. This is also how fine lines and scarring becomes "filled in" or smoothed out. Because of the tiny micro-punctures in the skin, dermarolling also improves your skins' ability to absorb products. 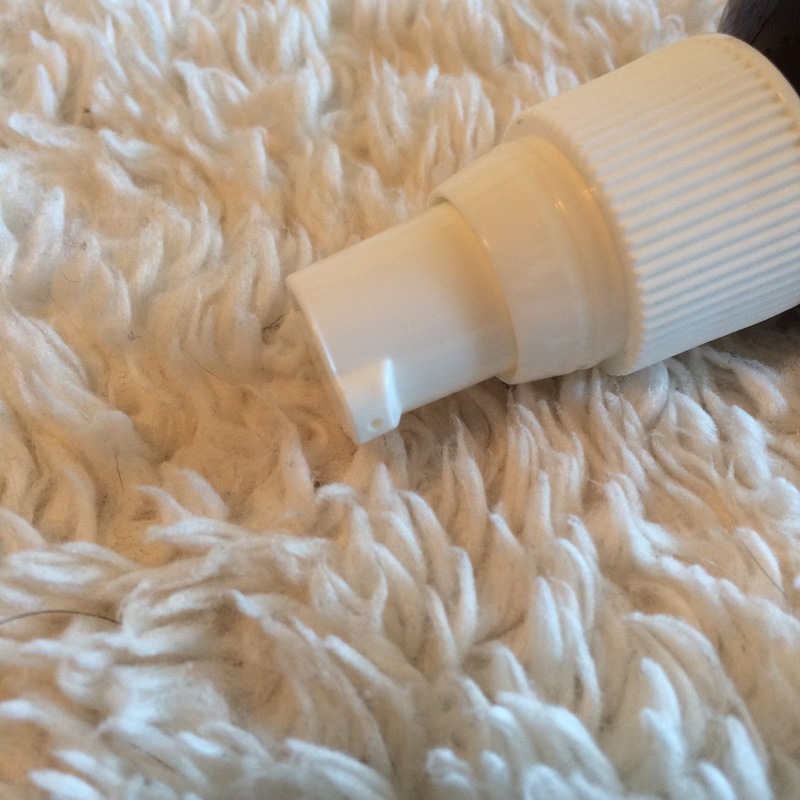 This makes ingredients like vitamin c, hyaluronic acid, and vitamin e much more effective as well. There are several different needle sizes to address different skin concerns, as I mentioned above this roller has .5mm needles. This size derma roller treats shallow scars, fine lines, sun damage, hyper pigmentation, and boosts product absorption. This size roller may cause some discomfort and minimal bleeding, but this is normal. I personally have not experienced any bleeding but do feel a bit of a burning sensation while rolling. 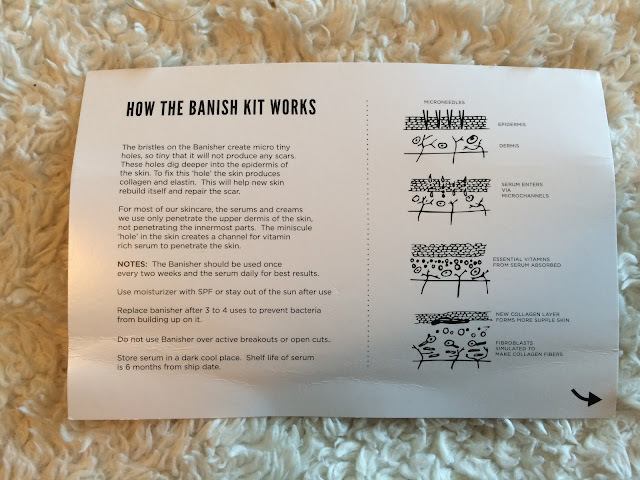 It can take up to a year to see dramatic results from a derma roller, but after two months of using the Banisher I have already noticed improvement in my stubborn hyperpigmentation. My acne scarring and redness heals more quickly, and my fine lines disappear after microneedling. 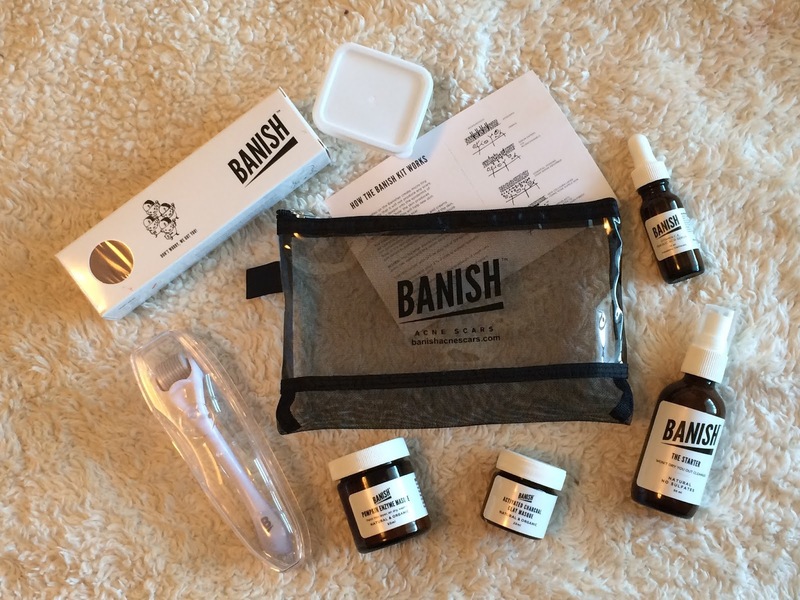 The Banisher is currently available for $49 with a bag and cleansing container, or in the Banish Kit for $75. This mask comes as powder in a jar that you mix with your own liquid. This mask contains activated charcoal and montmorillonite clay to absorb oil and purities, blue green algae powder and allantoin to reduce irritation, and tea tree and zinc oxide to help treat acne. The powder doesn't seem to have a scent alone but does have a light generic clay scent when mixed with water. I've discovered that this mask works best mixed to a more watery consistency. I've tried mixing it thicker, but it tends to just form lots of clumps, so thin and watery is best. Because charcoal can stain fabric (and hard porous surfaces) I like to use this mask before a shower, at the bathroom sink, and apply the mixture with a flat foundation brush. I like to leave this mask on until it's fully dry, and I can see excess oil being pulled from my nose (which honestly starts happening before half the mask is dry). This takes about 10-15 minutes because the mask is so thin. It doesn't tighten or harden and uncomfortably, and while I don't feel it dries out my skin, I know clay pulls moisture from the skin so I do always follow up with a sheet mask. 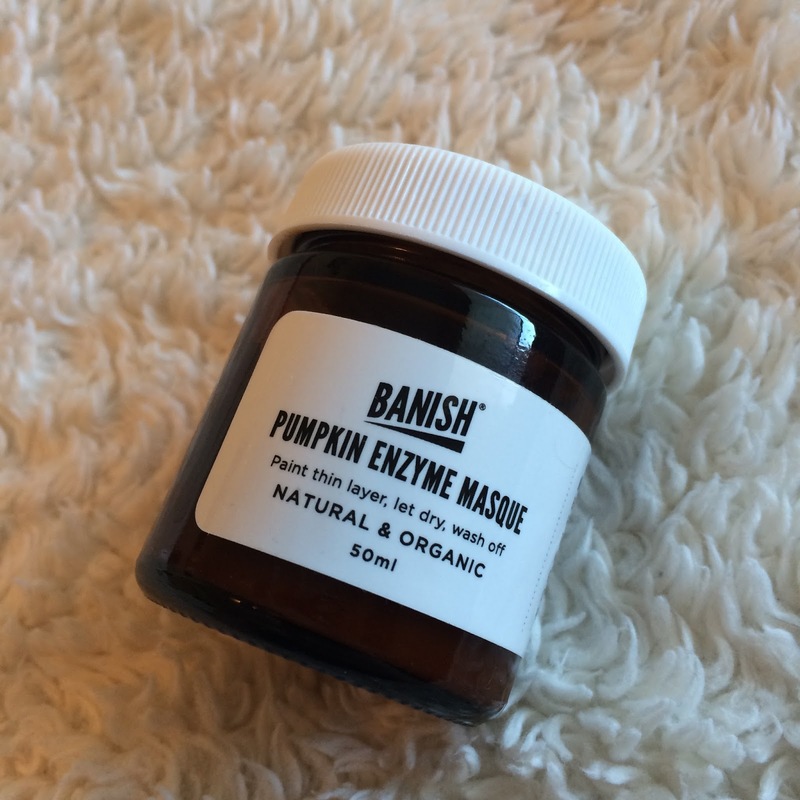 Banish recommends using this mask once or twice a week before the pumpkin mask, and I do this once a week to both prevent and treat active acne. 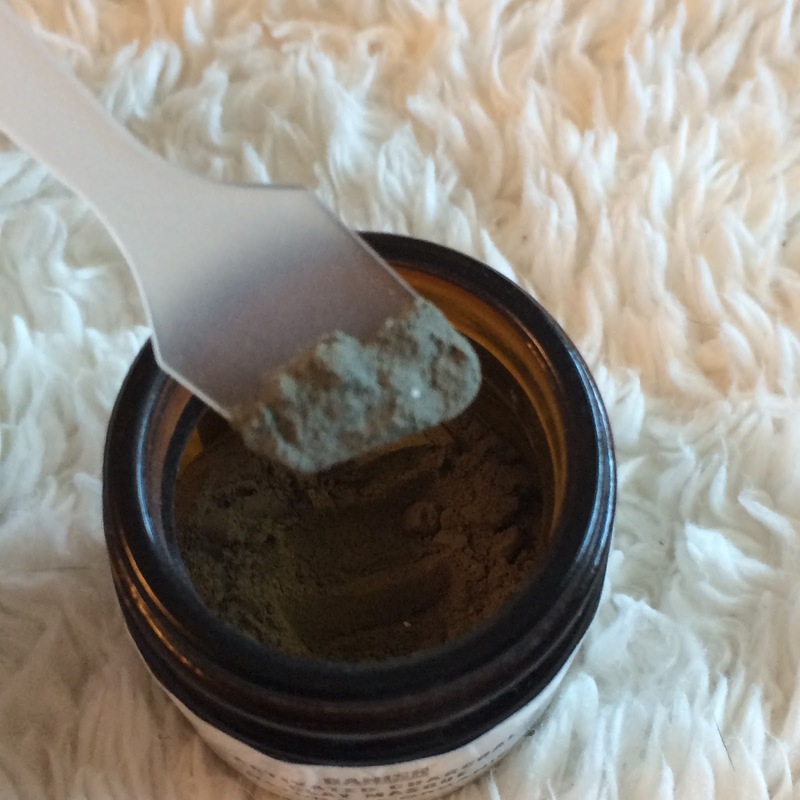 Ingredients: Montmorillonite (Italian Green Clay), Activated Charcoal, Allantoin, Zinc Oxide, Ascorbyl Palmitate (Vitamin C Ester), Aphanizomenon Flos-Aquae (Organic Blue Green Algae) Powder, Dimethylaminoethanol (DMAE), Melaleuca Alternifolia (Tea Tree) Leaf Essential Oil. 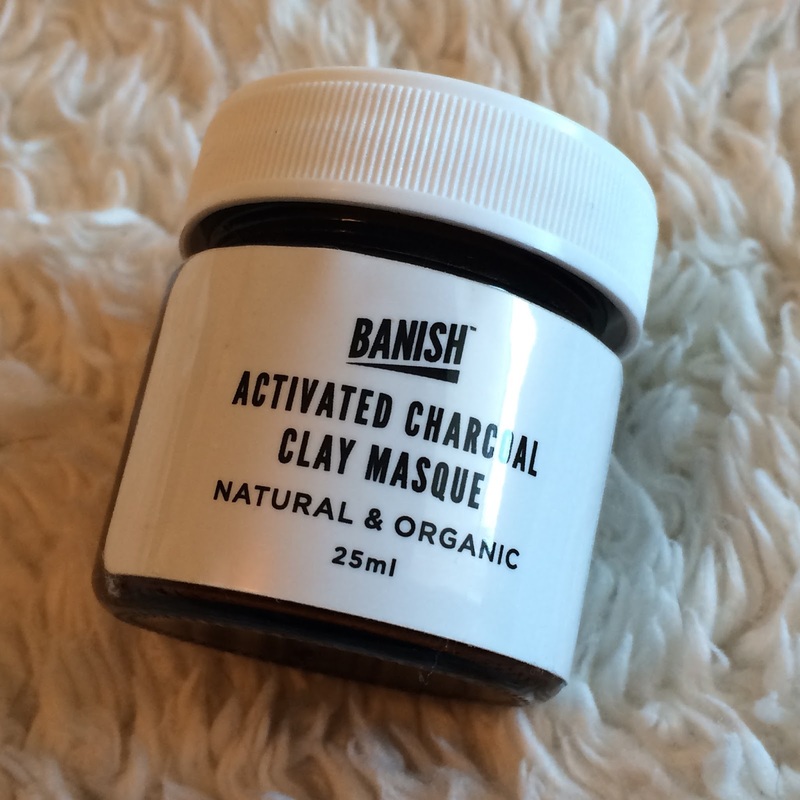 The Activated Charcoal Clay Masque is currently available for $29 for 25ml of product. 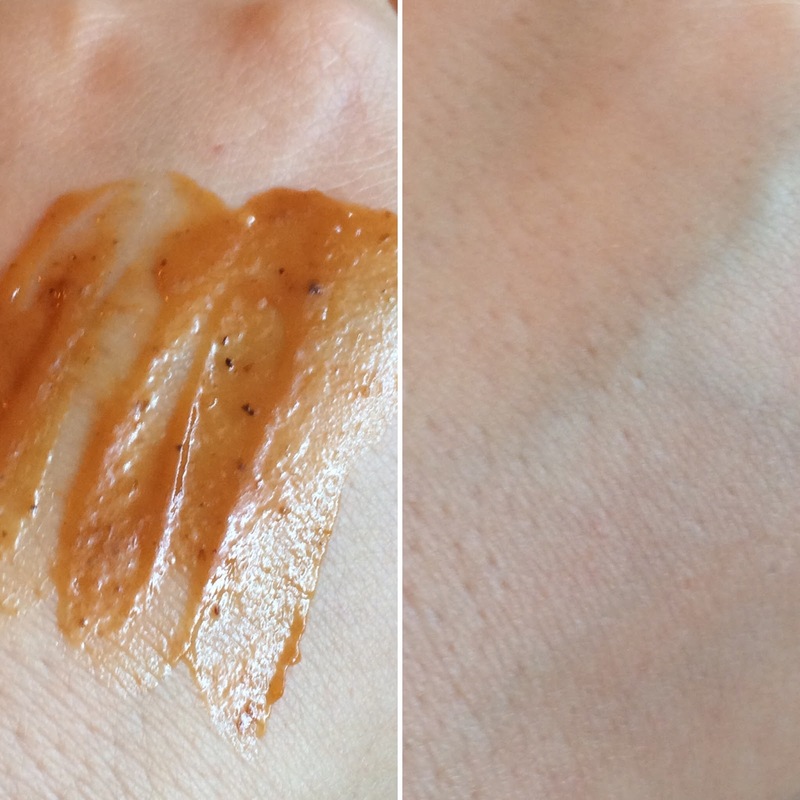 This is a creamy soft mask that smells like pumpkin pie with extra spice. Pumpkin is great for acne prone skin because it contains a slew of beneficial vitamins and minerals; vitamin a (smoothes and softens), zinc (fights acne), vitamin c (brightens and repairs), alpha hydroxy acid (brightens and exfoliates), and vitamin e (soothes). This mask also contains glycolic acid for added exfoliation and neem oil to treat acne. 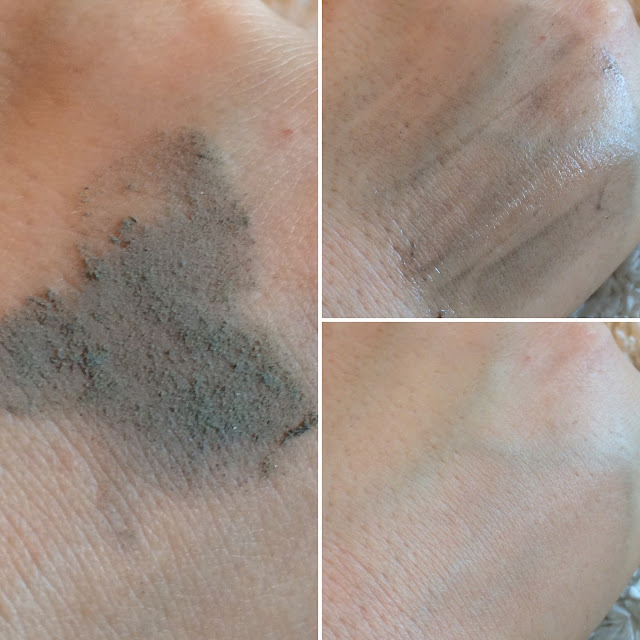 I like to apply a thin layer after using the activated charcoal clay masque, with a flat foundation brush. I sometimes feel a mild tingling when I first apply the mask - but if it feels too uncomfortable or irritating please wash it off immediately. Some people are especially sensitive to fruit enzymes (papain comes to mind) and it can be damaging. I wash the mask off after it's dried down - usually about 15 minutes later. 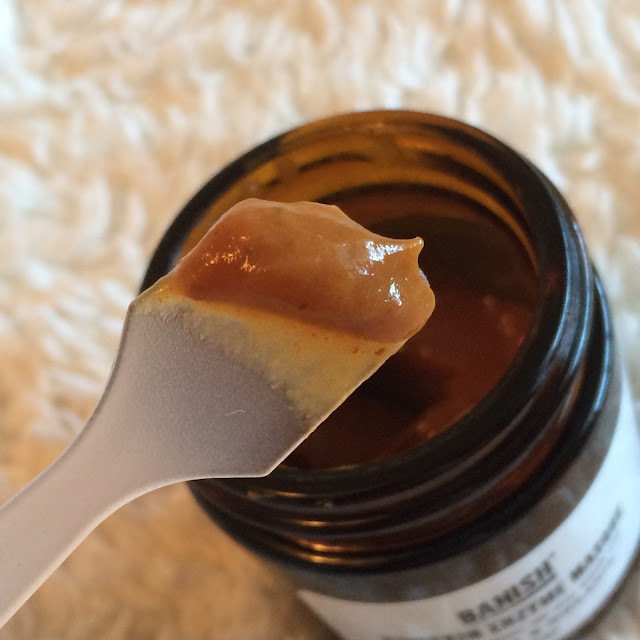 It does not harden like a clay mask, but you will feel the mask firm up as it dries. Afterwards my face is noticeably brighter, feels much smoother, and looks clearer. I'm impressed with all the Banish products I've been using, but I do think this pumpkin mask is my favorite. 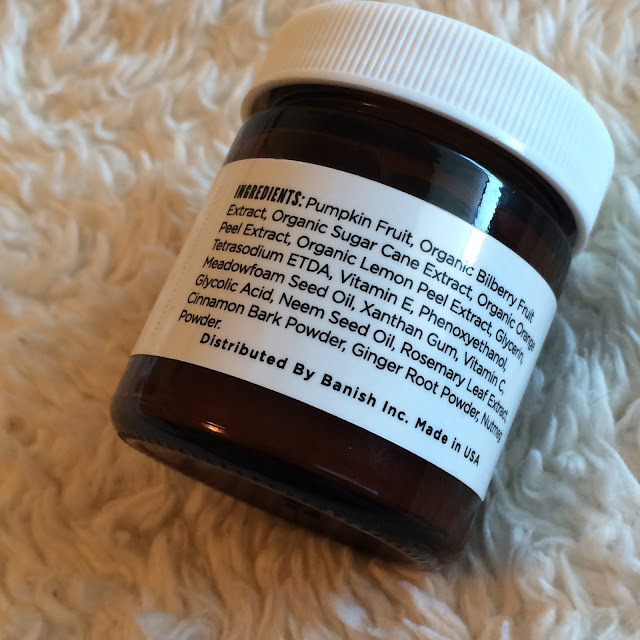 Ingredients: Pumpkin Fruit, Organic Bilberry Fruit Extract, Organic Sugar Cane Extract, Organic Orange Peel Extract, Organic Lemon Peel Extract, Glycerin, Tetrasodium ETDA, Vitamin E, Phenoxyethanol, Meadowfoam Seed Oil, Xanthan Gum, Vitamin C, Glycolic Acid, Neem Seed Oil, Rosemary Leaf Extract, Cinnamon Bark Powder, Ginger Root Powder, Nutmeg Powder. The Pumpkin Enzyme Masque is currently available for $35 for 50ml of product. 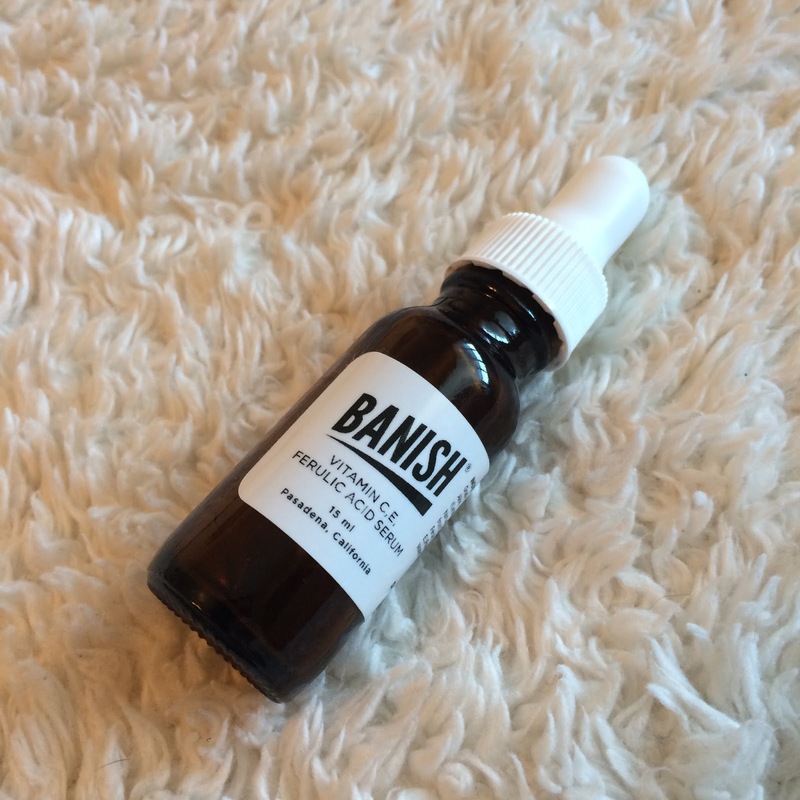 Overall, I really do think Banish makes some great products for acne prone skin. 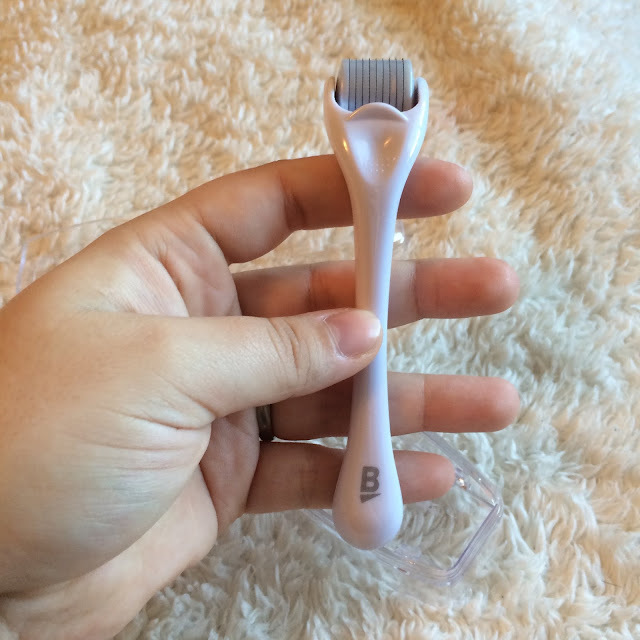 I have found a love for dermarolling, and have seen positive enough results to keep up with it for now. I also plan to keep the Starter Cleanser and Pumpkin Enzyme Mask in my routine, as I see amazing results from those as well. The Charcoal Mask and Vitamin C Serum aren't bad, but I have similar products already that I plan to use again after those are gone.